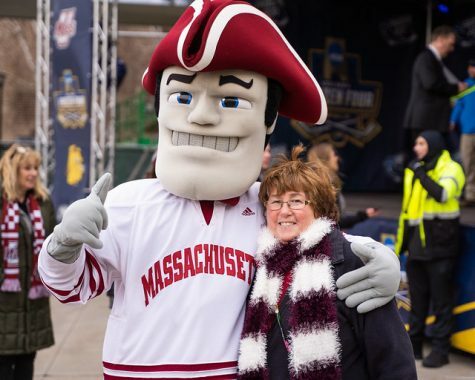 With the final Hockey East playoff spot on the line, the Massachusetts hockey team will honor its seniors on Friday as it looks to keep its season alive against Merrimack. The Minutemen (12-15-5, 8-13-4 Hockey East) have four seniors stepping out on home ice for the final time as they host the Warriors (16-9-7, 12-8-5 HEA). The four seniors include captains T.J. Syner and Danny Hobbs, assistant captain Michael Marcou and walk-on goaltender Kevin Moore. 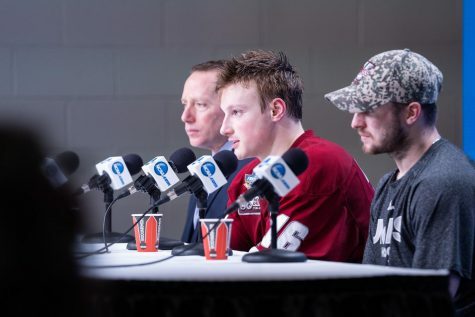 “The seniors are an integral part of what we do this year, and those four players have been an integral part of what we’ve done over the past four years,” said UMass coach Don Cahoon. 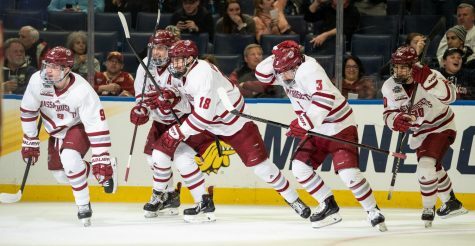 Syner has held a consistent role in the lineup throughout his tenure at UMass, totaling 93 points (35 goals, 58 assists) while serving as an assistant captain his junior year and captain his senior season. The forward is also a two-time member of the HEA All-Academic team and has been named a candidate for the 2012 Hobey Baker award and the Walter Brown award. 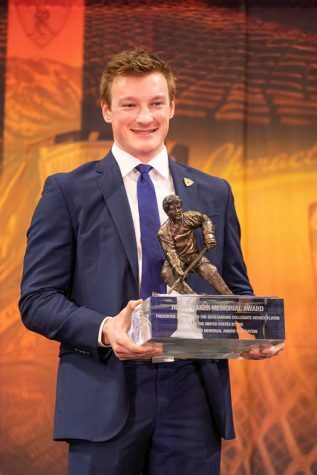 The Hobey Baker award is given to the nation’s top college hockey player, while the Walter Brown award is given to the top American-born college hockey player in New England. One of Syner’s best performances this season came Jan. 13 against then-No. 4 Boston College, where his two goals propelled the Minutemen to a 4-0 win. The other captain being honored this weekend, Hobbs, has also found himself in the lineup on a consistent basis throughout his career. 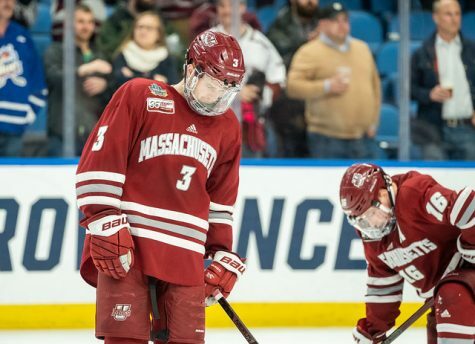 Despite a slow start at UMass, – he tallied 11 points (four goals, seven assists) in his first two seasons – Hobbs had a breakout year as an assistant captain his junior season with 12 goals and 16 assists. 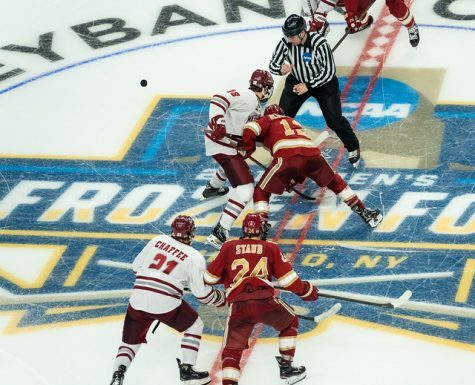 Part of the reason Hobbs expected success coming to UMass was the fact that he the New York Rangers drafted him in the seventh round of the 2007 NHL Draft. In his senior year, he has contributed 22 points (10 goals, 12 assists), despite being slowed by a groin injury earlier in the year. 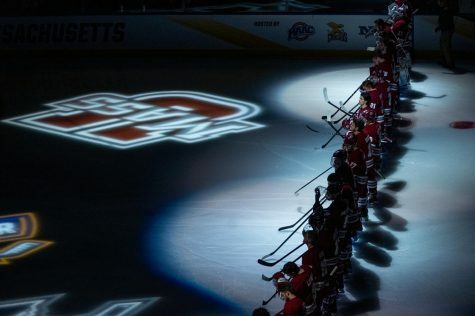 The Minutemen got the best out of Hobbs this season from Dec. 2 to Jan. 20, when the forward registered 11 points in a span of eight games, capped off by a hat trick in a 4-3 win over Vermont. Also stepping out on the Mullins Center ice for the final time is Marcou. In his four years at UMass, Marcou has notched 40 points (17 goals, 23 assists), with 18 of them coming this season. As a defenseman, one of Marcou’s biggest assets has been his discipline. This season, he has only been in the penalty box eight times for a total of 16 minutes, giving him 33 penalties and 77 penalty minutes for his career. 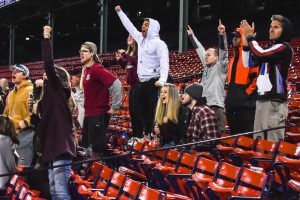 One of Marcou’s biggest moments of his career came on Jan. 7, when the Minutemen hosted the Catamounts at Fenway Park. The defenseman scored the game-winning goal in overtime to seal the win for UMass. “It’s a little nerve-racking, but you try to put that aside and go out and play,” Marcou continued. Also being honored Friday night is Moore, who walked on to the team in 2009 in the middle of his freshman year. He was named to the Hockey East All-Academic team as a sophomore. Moore’s strong work as a backup has not gone unnoticed by his coaches or teammates. 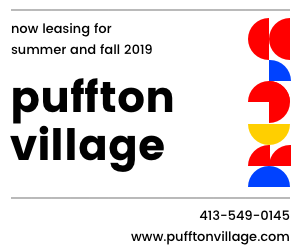 “Kevin’s contribution has been a little bit different in the way it’s shaped, but it’s a pronounced contribution that’s significant, and all the players in the locker-room appreciate it,” said Cahoon. 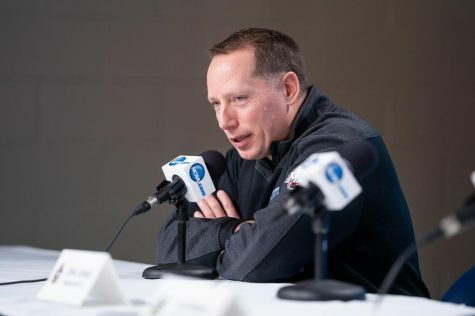 With only two games left in the season and his team tied with Northeastern for the final playoff spot, Cahoon expects that his seniors won’t finish up their career this weekend. 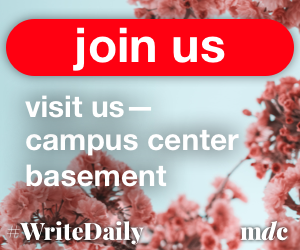 “I have no intentions of even crossing that bridge of this being the last weekend of the year and I don’t think the seniors do either,” said Cahoon. The puck drops Friday night at 7 p.m. at the Mullins Center. Nick Canelas can be reached at [email protected] and followed on Twitter @MDC_Canelas.